Simon & Schuster, 9781476747095, 224pp. 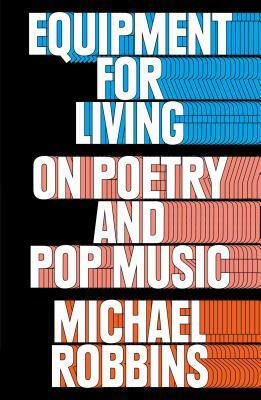 Brilliant, illuminating criticism from a superstar poet—a refreshing, insightful look at how works of art, specifically poetry and popular music, can serve as essential tools for living. How can art help us make sense—or nonsense—of the world? If wrong life cannot be lived rightly, as Theodor Adorno had it, what weapons and strategies for living wrongly can art provide? With the same intelligence that animates his poetry, Michael Robbins addresses this weighty question while contemplating the idea of how strange it is that we need art at all. Ranging from Prince to Def Leppard, Lucille Clifton to Frederick Seidel, Robbins’s mastery of poetry and popular music shines in Equipment for Living. He has a singular ability to illustrate points with seemingly disparate examples (Friedrich Kittler and Taylor Swift, to W.B. Yeats and Anna Kendrick’s “Cups”). Robbins weaves a discussion on poet Juliana Spahr with the different subsets of Scandinavian black metal, illuminating subjects in ways that few scholars can achieve. Equipment for Living is also a wonderful guide to essential poetry and popular music.